Freebies like Wi-Fi and breakfast make the Comfort Inn Fresno West Shaw a savvy choice for bargain hunters. The low-rise Comfort Inn West Shaw offers 69 rooms with free Wi-Fi flat-panel cable TV a coffeemaker refrigerator microwave and work desk. Non-smoking rooms are available. The hotel provides free hot breakfast each morning. Guest can work up a sweat in the fitness center then make a cool splash in the outdoor pool. The hotel offers fax/copy services and parking spaces large enough for trucks. Along Highway 99 this Comfort Inn is less than a mile from the Island Waterpark. The Fresno Chaffee Zoo is six miles away and Fresno State University is seven miles from the hotel. Fresno Yosemite International Airport is a 14-mile drive. 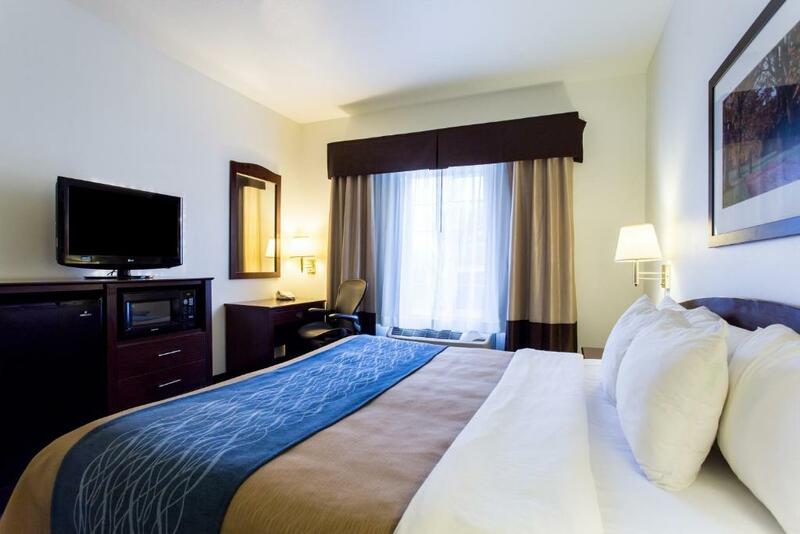 our guests prize the Comfort Inn's free Wi-Fi and handy location right off the freeway near the airport and restaurants.